Happy New Year, lovelies! I hope 2014 has been treating you all well so far. Unfortunately this new year hasn't started off so great for me, as I have come down with a cold. Boo! But I am doing all I can to get better and recover quickly. Colds are no fun. 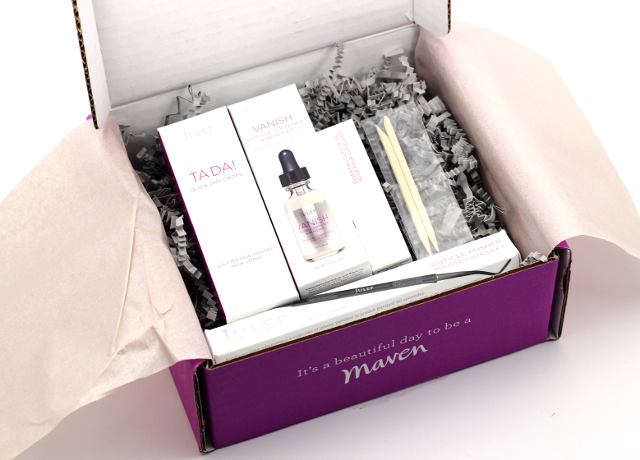 For my first post of the new year, I am going to be sharing with you all what I received in my January Julep Maven box. This month I decided go go with the modern beauty box since I really wasn't feeling the January nail color selections. The modern beauty box contained essentials that are great for the caring of the nails and cuticles-something I so desperately need. I received the Vanish Cuticle Softener & Remover, Ta Da! Quick Dry Drops, and the Essential Cuticle Oil. I also added onto my box the Cuticle Pusher to use along with the Vanish Cuticle Softener & Remover. Vanish Cuticle Softener & Remover: I don't have a product that specifically targets the softening and removal of the cuticles, so this paraben and sulfate free, lanolin-infused treatment is a refreshing addition to my nail care routine. I love how easy this is to use. For each bare nail I add a drop to the base of nails and then gently push back the cuticles with the cuticle pusher-the box also came with wood sticks which work just as well. After using Vanish I can definitely see a difference in my cuticle area. They are much smoother, neater, and they look a whole lot healthier to boot. And as a bonus, Vanish also helps with the removal of residual nail stains! Cuticle Pusher: This high quality cuticle pusher is made of stainless steel, and it's bacteria-resistant thanks to it's Teflon coating. The ergonomic design of the cuticle pusher makes it super convenient to use. It's a cinch to grip, and the hook-curved ends perfectly align with the nail beds. TA DA! Quick Dry Drops: These vitamin E infused quick dry drops were probably the most intriguing item in the box for me since I have never used anything like it. Drops to speed up the drying time of your polish? Yes please! I am happy to report that TA Da! Quick Dry Drops don't disappoint. 1-2 drops of this on each nail left my polish dry and touchably smudge free within minutes. Love it! Essential Cuticle Oil: I think one can never have enough cuticle oil. It's such an essential to have, especially during these cold winter months, when the weather wrecks havoc on our hands. Julep's Essential Cuticle Oil contains vitamin E and essential oils to help nourish and soften cuticles. This has a really lovely soft scent, and the roller ball apparatus makes application a breeze. I like that this oil is so easy to massage into the cuticles, without leaving behind a greasy residue. I loved Julep's January Modern Beauty box! All of the products make for awesome new additions to my nail care routine. I am sure that with these items at hand, my nails will always be in tip top shape. I can't wait to see what Julep has in store for us in February. 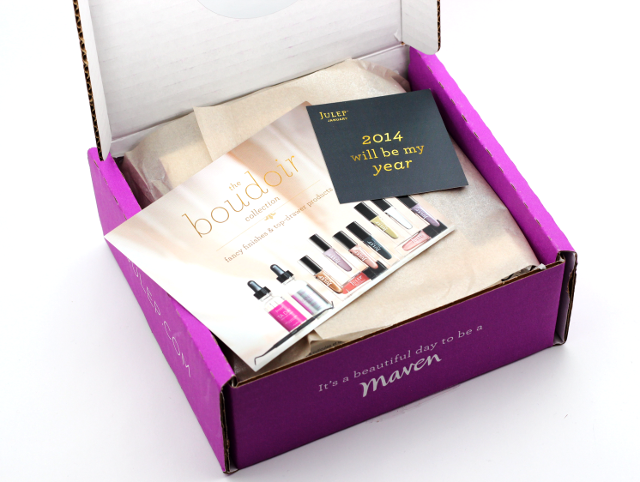 What did you all receive in your January Julep Maven box? Which are your favorite nail care products?